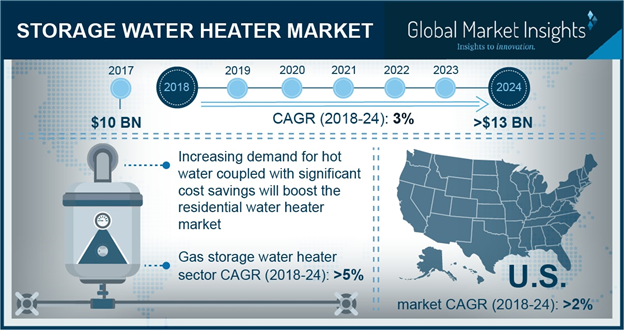 Storage Water Heater Market size is set to exceed USD 13 billion by 2024; as reported in the latest study by Global Market Insights, Inc.
Increasing hot water demand coupled with the adoption of advanced technologies will stimulate the storage water heater market. Significant government investment toward the development of smart cities will enhance the industry outlook. The Government of Canada in 2017, developed the ecoENERGY program for facilitating the adoption of efficient heating systems. The authorities promoted the program by providing incentives for installation of appliances across commercial establishment and educational institutes. The U.S. market is predicted to exceed USD 1 billion by 2024. Rapid growth across the service sector along with ongoing regulations toward the deployment of efficient electrical appliances will positively influence the business outlook. Replacement and upgradation of existing systems with compact designs and energy efficient models will enhance the industry outlook. Introduction of IoT across water heating industry coupled with growing adoption of unvented pre-plumbed systems primarily across construction sector will augment the electric water heater market growth. Growing adoption of highly efficient and convenient heating solutions along with consumer proclivity toward savings in energy bills will positively impact the business outlook. As per U.S. DoE, electric water heaters have the capability to provide 27% - 50% energy savings at each hot water outlet. Improvement in living standards coupled with substantial growth in urbanization owing to increasing disposable income will accelerate the Asia Pacific market growth. In addition, effective modernization and replacement measures for existing traditional heating systems with an aim to provide energy efficiency will increase the product adoption. As per the World Urbanization Prospects, the region has witnessed 54.7% urbanization rate in 2017 when compared to 53.8% in 2015. 100-250 liters system is set to witness rapid growth on account of stringent building standards and codes coupled with ongoing investment toward the construction of sustainable infrastructure. Industry players are adopting strategic initiatives toward upgradation of existing heating systems in order to reduce the cost of energy and minimize the large standby losses. Technological integration toward hybrid and flexible heating systems along with sizeable investments toward the reinforcement of conventional infrastructure will stimulate the commercial water heater market. Increasing deployment of water heating systems across healthcare, hotels, offices, universities, shopping complexes and public buildings will propel the product penetration. Quick recovery rate, mass flow and low operational cost when compared with its available counterparts will drive the natural gas water heater market growth. Deployment of gas variants results in cost saving owing to ease of accessibility across gas abundant regions. In addition, suitability for commercial application coupled with quick heating capability will enhance the industry outlook. Key players across the global market includes Rinnai Corporation, Bradford White, A.O Smith, Ferroli, Bosch Thermotechnology, Rheem, Saudi Ceramics, State Industries, Haier, Hubbell, Jaquar, Ariston Thermo, Whirlpool, Kanch Water Heaters, Viessmann and Vaillant.